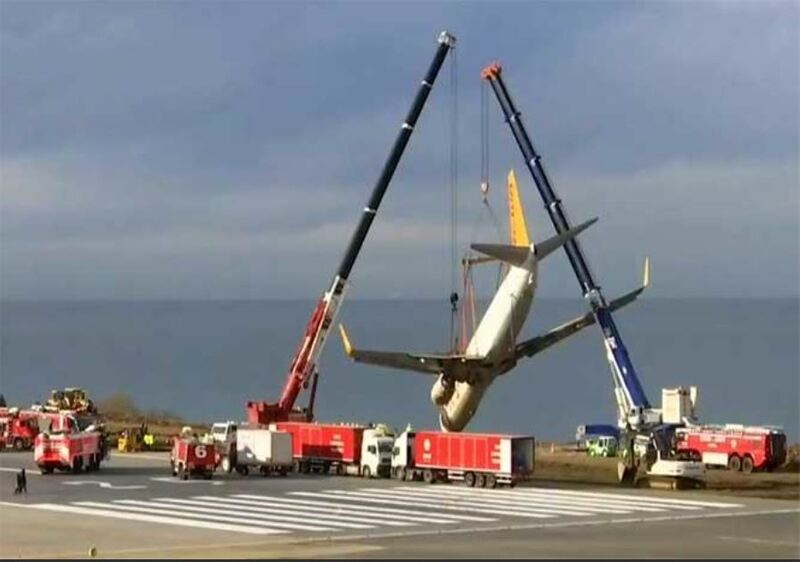 737-800, TC-CPF, (40879/4267) operated by Pegasus Airlines was operating from Ankara to Trabazon when it suffered a runway excursion during landing at Trabazon runway 11 at 20:26Z (23:26L). 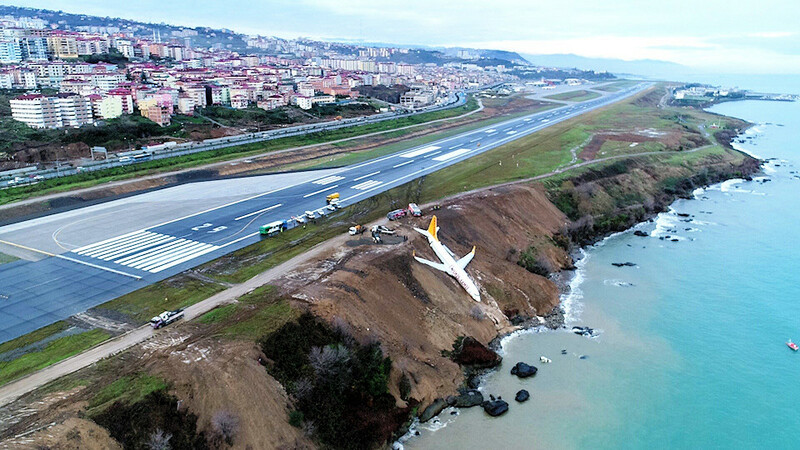 The aircraft departed the left hand side of runway 11 approximately 2400m past the threshold, went across the grass and went down over a steep hillside towards the sea. The flight was carrying 162 passengers, 2 pilots and 4 crew, the aircraft was evacuated on the hillside with only 3 minor injuries. The METAR history indicates that there had been light rain for approximately 90 mins before the incident. There was a slight tailwind on runway 11 but it is the preferential runway for tailwinds up to 5kts when wet as runway 29 only has an offset VOR approach with 3.5 deg PAPIs. Runway 11 is 2640x45m and an elevation of 104ft. The ILS has a 3.3 degree glideslope with DA minima of 600 / 540 / 490 ft depending upon go-around climb gradients of 2.5%, 3.5% and 4.5% respectively. All of which appear to be below the cloudbase in the METAR. 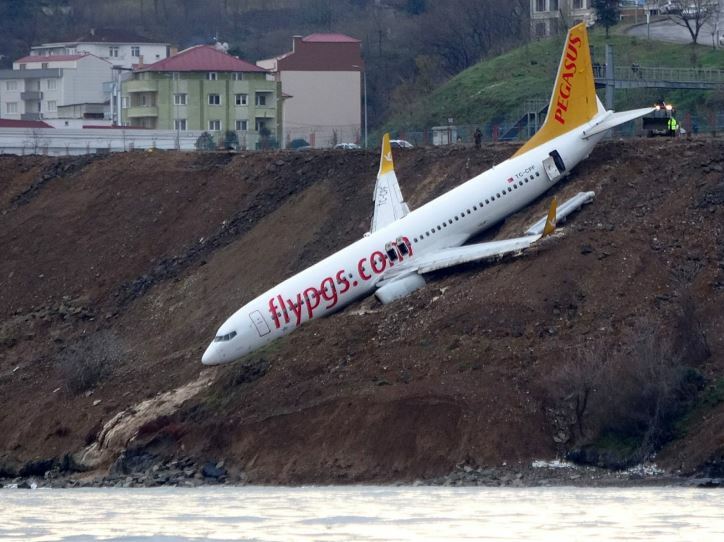 Turkish sources say that the flight crew reported the flight was normal until after touch down with the First Officer PF, deceleration was slow due to the wet runway. The controls were handed to the captain who applied brakes. The aircraft veered left and went off the runway, the right hand engine suddenly accelerated in forward thrust unintentionally. 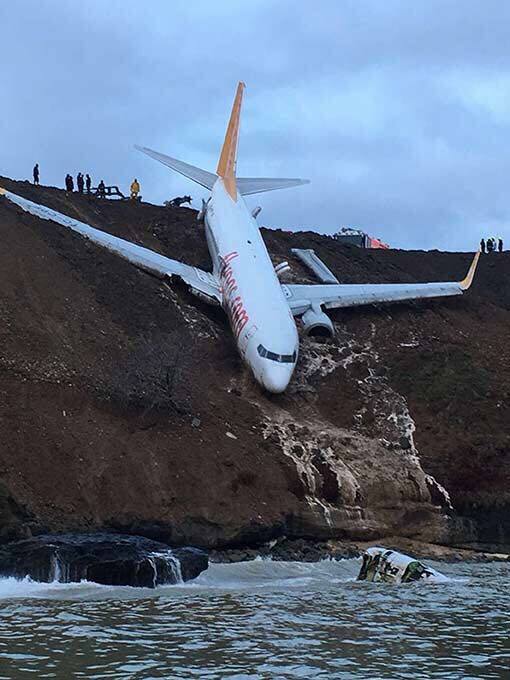 TC-CPF After the runway excursion. TC-CPF After the runway excursion. The detached engine #2 is visible in the Black Sea.